HOUSTON - Hundreds of thousands of Texans were without power along the Gulf Coast as Tropical Storm Harvey left parts of the Houston area under water. There were roughly 280,000 customers without power along the Texas's coast and in Houston and the surrounding areas on Monday, according to reported outages by the state's investor-owned utilities. Harvey, which made landfall on Friday, caused devastating flooding and knocked out power lines along its destructive path. CenterPoint Energy reported more than 100,000 outages earlier on Monday, though that figure was down to 91,744 shortly after 1 p.m. on Monday. The company said it was unable to access hard-hit areas until floodwaters recede and electric infrastructure dries out. Outages in the most flooded areas could last for several days, CenterPoint warned. AEP Texas's coverage area south of Houston had 150,500 customers without electricity as of 11 a.m. ET on Monday. That was down from the peak of its outages on Saturday afternoon, which affected 220,000 customers. Corpus Christi and the surrounding areas along the Gulf Coast were still experiencing the most outages. AEP credited assistance from out-of-state workers for helping to get the lights back on. "Thousands of resources have arrived from across the country to help AEP Texas with restoration efforts following this historic weather event. Crews from Kentucky, Illinois, Missouri and other states have arrived and are working on restoring power to those impacted by Hurricane Harvey," AEP said in a statement. 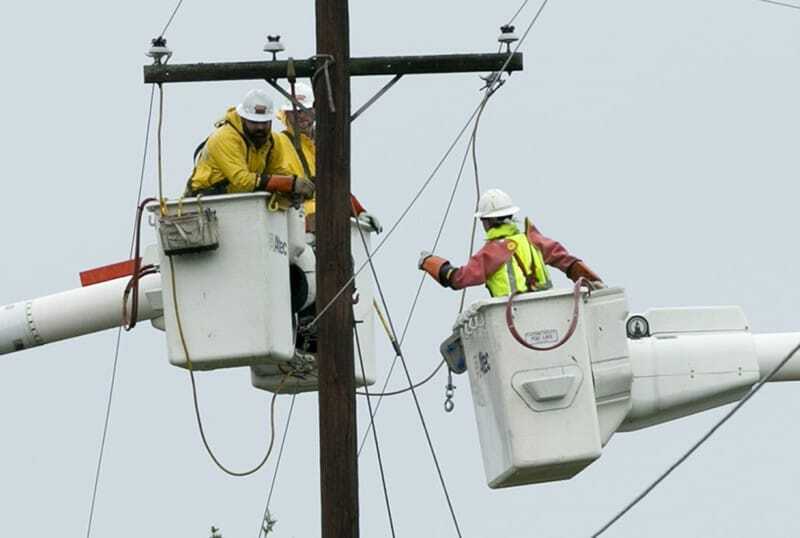 Entergy reported 29,500 customers were without power on Monday in areas north of Houston. The company warned that additional outages were expected if Harvey moves inland near the island city of Galveston on Wednesday as anticipated. Houston, Beaumont and Victoria are expected to see continued periods of torrential rain through Tuesday, before Harvey begins to move north on Wednesday and out of the flood zone by Thursday. "Our crews are safely restoring power as quickly as possible, but the continued wind, rain and flooding are having an impact on restoration efforts," Entergy said in a statement. South of Houston, about 7,500 Texas New Mexico Power Company customers were still experiencing outages, according to the company's outage map.